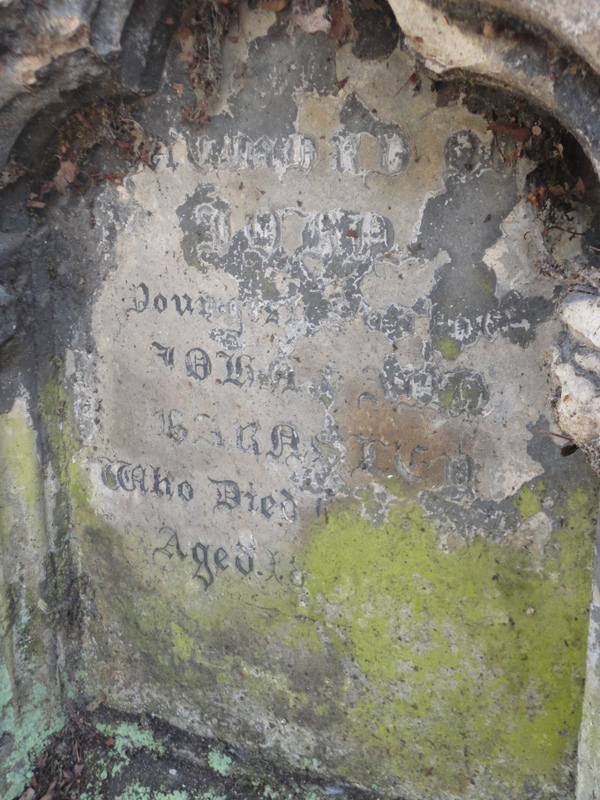 Who could resist the offer of an assignment in the Jewellery Quarter graveyards? Well, truth be told I did ask if I could go along the next time Sarah was working there. A brisk walk and a take-away cuppa later, we were splashing through the mud in Warstone Lane cemetery. I was surprised to find out that the scattered marks on some headstones are in fact bullet marks from German World War 2 gunners. 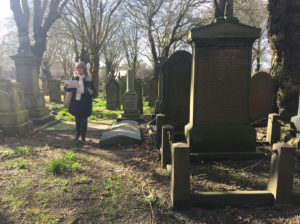 The assignment was based in Key Hill cemetery and involved locating the site of some particular headstones. I knew from family history research that graveyards are divided into numbered compartments and each grave should have a specific number recorded somewhere on the headstone. 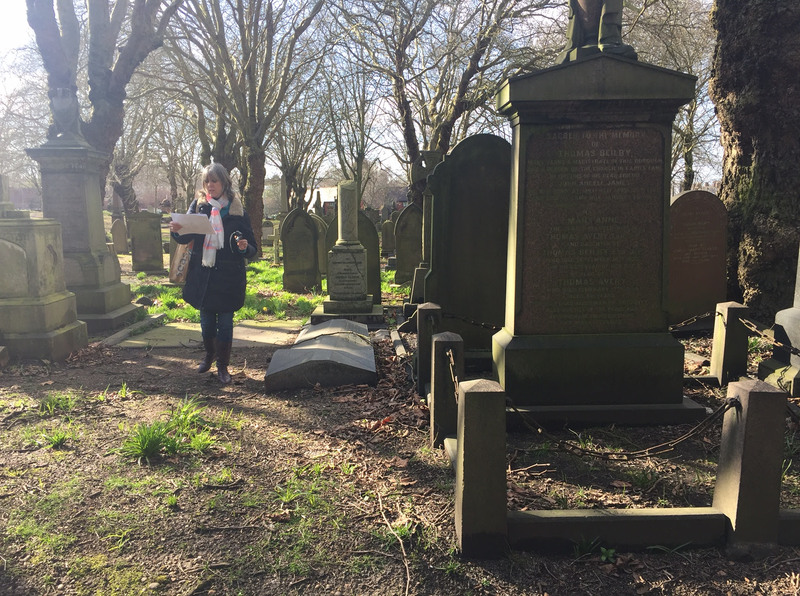 In some cemeteries it’s more clearly marked than in others, but with our combined map reading skills, logical thinking, intuition and sheer guesswork, we got the hang of it. Still splashing about in very wet, muddy ground, we started to find what we were looking for and the layout became clearer. Many of the headstones are of well known local dignitaries, politicians, luminaries and industrialists. I was curious about the less well known people, maybe the more ordinary citizens resting here. Carl (see image above to the left) seems to have arrived in England in March 1859 via Hamburg on the ship ‘Planet’. He was Prussian. He lived in Islington Row in the 1880s, working as a merchant’s clerk. Did he have a family? 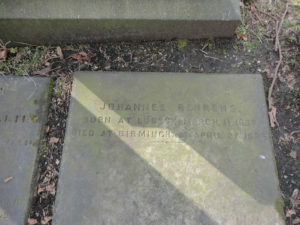 His simple headstone, like that of Johannes above, makes me think he had no-one here with him. Johannes (see image above to the right) lived in London in 1861 and then is found in Birmingham in 1871. By 1881 he was a merchant living in the Royal Hotel. 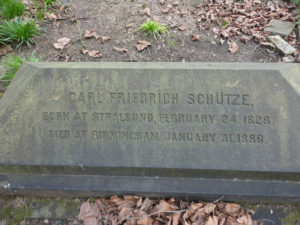 He died in 1894 in Greenfield Crescent, Edgbaston. Probate records show that he left £24, 308 19s 7d to Robert Hall Best, joint owner of Best and Lloyd Brass Foundry. It seems a large amount of money and I’d love to find out more about Johannes. Why did he leave his money to a wealthy manufacturer? Did he have any family? Census records show he was single with no dependents. His headstone is very simple, no personal tributes. Possibly the tomb of the family of John Barnsley. This grand resting place (image to right) is very worn and damaged, which makes me want to come along and clean it up, restore it to its former glory. It’s possibly the tomb of the family of John Barnsley, the builder whose firm built many of the city’s major landmarks, including the Council House, Art Gallery, Grand Hotel and Children’s hospital. Though my research is far from professional and this might be just a shot in the dark….. I had a great afternoon with Sarah, laughs galore, mud, tripping up, mishaps and some serious moments reflecting on the child mortality rates of the age. 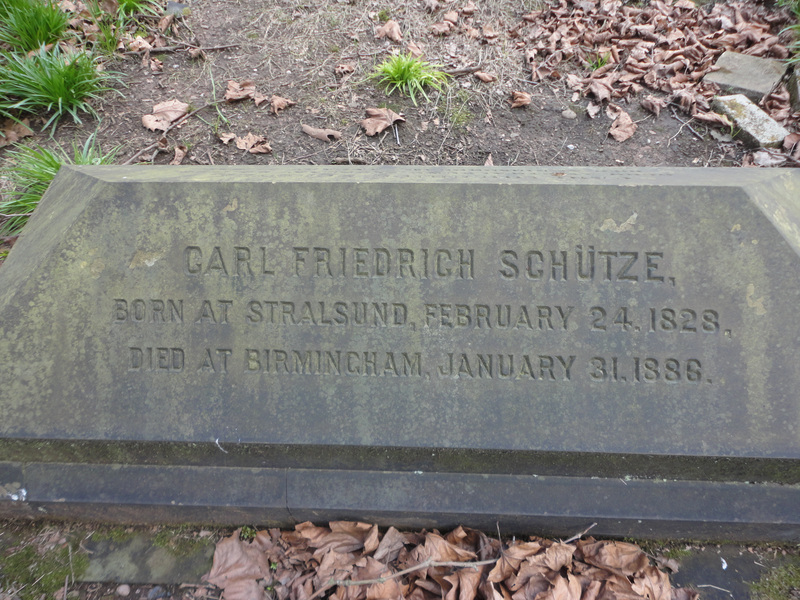 I’m taking up the challenge of finding out more about those regular Brummies who lie here, going back again soon to get more details. I want us to plant lots of bulbs so the cemeteries are celebrations of life as well as honouring death and passing.